It is well-documented that a significant portion of U.S. corporations rely on employment background screening services for hiring and employee retention decisions. For corporations that rely on the work of individuals, a comprehensive background screening program can offer significant value. If you could start over again and build your workforce from scratch, which of your employees would you rehire? What would you like to have known about your employees before hiring them? Background screening provides highly useful and informative information upon which better hiring decisions can be made. With screening, organizations can avoid bad hiring decisions that lead to turnover, poor productivity, and worse. The fear of being sued for negligent hiring is a huge factor in the decision to perform employee background screening. When sued, a company must be able to prove their diligence in the hiring process. A furniture company recently hired a delivery man without a background check or even requiring him to complete a job application. The employee later assaulted a female customer in her home and the company was charged with negligent hiring and deemed liable to the customer. Obviously, a background check would have gone a long way in protecting this company. In previous generations, one would be happy to obtain a job for life. It was common to be with the same company for 20 years or more. Now, the idea of a job for life is replaced by a mobile society comfortable with obtaining new employment on a regular basis. This increased cycle of recruitment makes it more difficult, yet increasingly essential to screen potential employees. Employers are responsible for employee behavior. Employers are held accountable for their employees in the workplace and sometimes even outside the workplace. Sometimes this is a good thing, as when employees produce excellent and timely work. Other times, this is a hazard, as when employees demonstrate irresponsible, violent, or criminal behavior. With this responsibility employers are striving to learn all they can about their current and potential employees in order to avert disaster. Background screening gives employers insight to make smarter predictions about how well an individual will represent their organization. Tighter measures are needed in tougher times. In the current economic climate and with higher unemployment, employers are scrutinizing applicants with greater care. Inflated and fictional employment history and qualifications become more common as people search for employment in tough times. Also, as more temporary employees and contractors are hired during economic downturns, screening of non-employees is also prevalent. On-the-job substance abuse costs the U.S. economy an estimated $60 billion a year. Illicit drug users are much more likely to have an accident, more likely to file a worker’s comp claim, have longer absences from work, and are generally less productive. As such, employers increasingly turn to drug screening to avoid or reduce substance abuse in the workplace. For many companies, it’s the law. Many organizations must conduct employment background screening to meet legal requirements. Financial, banking, education, transportation, health care, and law enforcement all have legal background screening obligations. Often, there is a contractual obligation to screen. Sometimes, companies are involved in contracts that require a specific background screening policy that may go above and beyond standard legal requirements. This is often the case in the transportation industry where transporters are contracted by distributors or others to handle sensitive items. To protect themselves, customers will require their transporters to screen drivers and others who will be responsible for their deliveries. Many believe the past predicts the future. The belief that a person’s past is the best indicator of what the future will hold is the underlying rationale behind employment background screening for many organizations. By looking into the past behavior of employees, organizations can make better predictions about how that individual will behave in the workforce and this information can lead to better hiring decisions. Background Screening is the right thing to do! Taking steps to ensure public and employee safety with a screened workforce is simply the right thing to do. It is this most basic and compelling reason that leads many organizations to implement an employment background screening program. Guess what? Employment background screening isn’t just for large corporations anymore. Unlike the past, background screening is no longer limited to sensitive or high level roles in large corporations. Rather, companies with minimum wage employees and volunteers are now screening applicants for positions that offer unsupervised access to people or property or other such positions in which hiring the wrong person can bring unwanted liability. 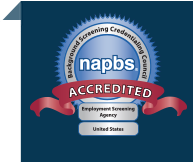 Employment background screening is smart and it works. To learn more, download our free guide, “Background Screening at a Glance” or learn about employment background screening.